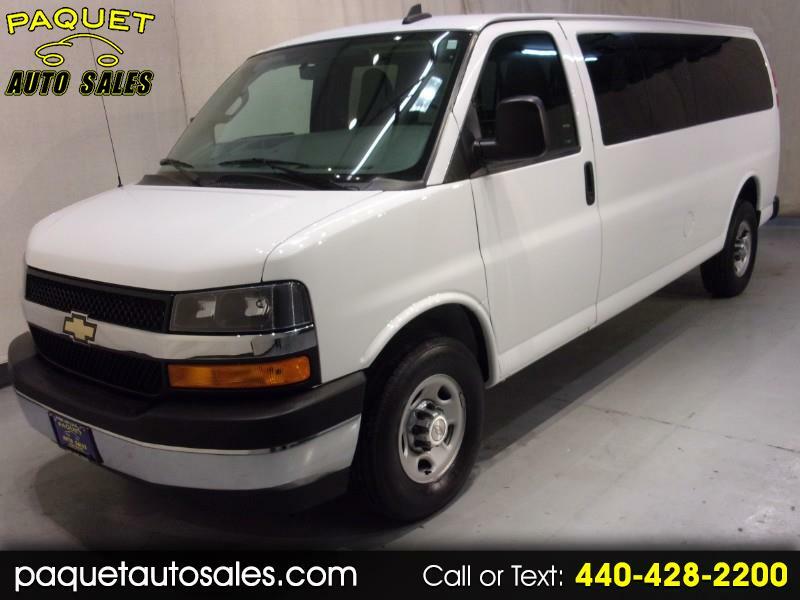 ONLY 40,000 MILES---15-PASSENGER VAN---ONE TON---CLEAN CARFAX REPORT---ON-STAR CAPABLE---FLEX-FUEL VEHICLE---6.0 LITER V8--- 2017 CHEVROLET EXPRESS 3500 in a white exterior finish with 5 rows of seating, 6-doors including two swing open on passenger side and two swing open on the rear, pop out side and rear windows including one manual on driver's side and one on passenger side, tinted rear windows, 16" silver steel wheels with chrome center caps, Bridgestone tires, black grill with chrome strip, automatic headlights, traction control, black door handles and folding exterior mirrors, chrome bumpers with rear step, keyless entry with remote. Clean both outside and inside where you will find a gray cloth interior featuring power windows and door locks, front bucket seats with armrests, center storage,beverage console, tilt steering wheel with mounted cruise control, air conditioning with rear air, CD/Satellite ready radio with aux. input, front 12 volt power outlet, front USB charging outlet and 120 volt A/C power outlet, dual vanity mirrors with illuminated passenger mirror, front rubber floor mats, middle row bench seats with rear split bench seat, full floor carpeting. Fully inspected by our service technician. Detailed inside and out and ready for delivery. Stop in or call today and speak with one of our friendly sales staff with any questions that you may have.